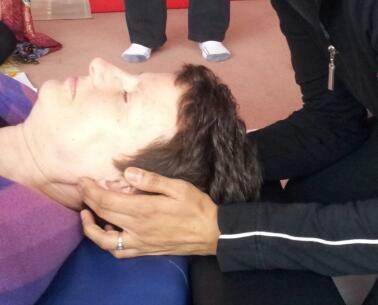 This is a gentle but very effective technique for neck pain and restricted neck mobility from a misaligned atlas vertebra. It’s also helpful if you’re feeling overwhelmed with too much to ‘do’ or you just can’t get on and complete things. The technique is taught in more detail in the Spine Alignment & Body Intelligence workshop, but here is a simple version you can try yourself. The atlas, or 1st cervical vertebrae, has a natural movement which can become restricted or unbalanced. When it is functioning optimally, it moves in an horizontal infinity pattern, gently reverberating this rhythmic movement throughout your spine. In Shin Tai philosophy, there is a correspondence between stress in the atlas and your energy being projected into the future/having a fear of the future which can also manifest as overwhelm or anxiety. Lay on your back and lightly touch each side of your atlas, directly under the mastoid process. Enjoy the side to side sway of its subtle motion, noticing restriction or asymmetrical movement. Encourage more symmetry and freedom of movement with your intention – don’t apply more pressure! Pay attention to sensations in your body. Feel for a softening of any rigid sensation in the atlas, and/or for the shape and movement to become more clear. Do this for 5-10 minutes. After treating yourself, notice changes in your feelings, mental state, and physical condition throughout the next day or two. I often use this technique when I’m lying in bed unable to sleep, thinking of everything I have to do! Give it a try and let me know how you get on!